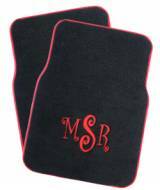 Monogrammed Car Mats - Front-Wheel Drive . . . Car Monograms are the hottest and the newest trend for girls from 16-50!! Monograms for the car make a great gift for the first time driver! Put them on your cars windshield or bumper!! Since the launch of these items; they are really keeping us busy!!! Some of my friends even have monograms on their golf carts!!!! I also have a pink princess crown decal on my wind shield ( yes my husband will still drive the car.) 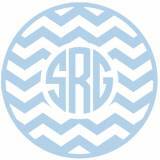 Monogrammed decals take about a week to be made. These do not hurt your car and can be peel off with a little Goo-be-gone. Check out the big Wall Monograms! !